Assembly of members composed of a triangular substructure to form the frame of a sloped roof; it supports the roof. Diagonal member supporting the principal rafter, joining it to the junction of the king post and the ridge beam. Level member at the base of a truss upon which the side posts and the king post rest; these in turn support the principal rafters. Small vertical member supporting the principal rafter. Vertical member supporting the tie beam and joining the principal rafters to the ridge beam. 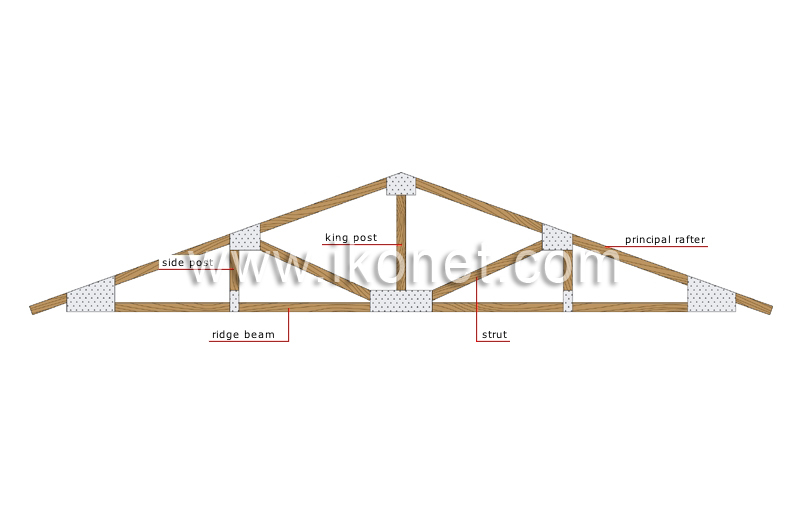 Diagonal member of a roof truss; it functions as a rafter.